The quest begins at Giran Castle Town in the temple at Priest Pupina. When you talk to Pupina, she will hand you a book as a quest item and send you off to Execution Ground to go and hunt the Nameless Departed Spirit [Nameless Revenant]. 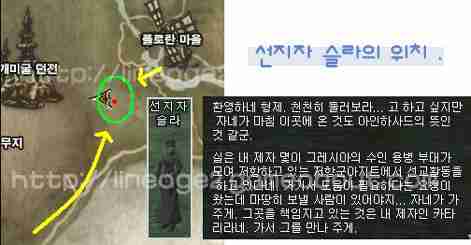 Many spirits can be found at the red dot on the map. From Giran, go towards Dion through the northern entrance using the upper road. Then you can see the valley at the back of Execution Ground. It is the way to the 2nd floor. If you go through that entrance, in the ground at the front you'll see a hole. The spirits can be found there. When you kill the spirits, they will drop the quest item Torn Journal Piece. When you have collected 7 of these pieces, when the last spirit dies, it will summon Aruarune [looks like a mandragora complete]. When you kill the aruarune, you will get the quest item giant nail. You need to take this back to Pupina. Then Pupina will send you off to go find Prophet Sla [prophet or seer]. Sla is not located in the Wastelands. She is located more towards the road by Floran. If you take the gatekeeper from Gludin to the southern area of Wasteland and follow that yellow arrow on the map, you'll be able to find Sla quickly. Ok,what's confusing is that Sla in the picture is talking about Partisan's Hideaway, but the NPC you are supposed to find got moved over near the Dark Elven swamp area (a little north of the waterfalls). You need to be looking for Katari. Katari is located at the red dot. South-west of Dark Elven village, but north of the waterfals. NOTE: this part is confusing. Read this part carefully. While killing the monsters in this sequence, don't kill the pilgrim. Step 1 - Talk to Katari and give the letter. She will ask for help with the inspector. Say you will help. Step 2 - Two monsters will appear when you accept. However, one is the Ol Mahum Pilgrim. Do NOT kill that one. Kill the other one that is called Ol Maum Inspector [I will check changed English client's name later.] When you kill this one, another monster will be summoned. Step 4 - Now talk to the Ol Mahum Pilgrim you were not supposed to kill. It will give you a Ol Mahum Coin. Click on Katari. Katari will give you a letter and send you back to Sla. So now you are back at Sla. Sla will say it's fortunate that you were sent and praises you then, like Katari, will have work for you and will tell you to go meet 3 of her disciples. The very first one you need to go find is Kakan who is located in the Orc Region but located very south-east of Orc Village. 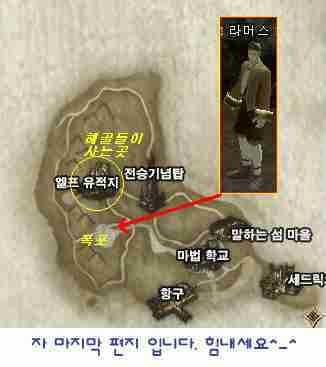 Kakan's location is waaay south-east of the Orc Village. 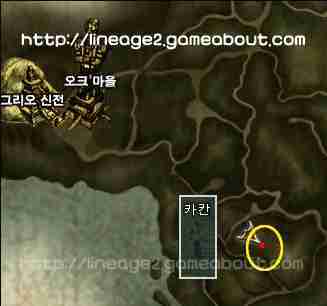 Orc Village and Temple of Paagrio are the two map locations in the upper-left corner. When you talk to Kakan, Kakan will mention how she is having troubles with some wolf packs and needs your help. When you talk to her the monsters will appear but Absolutely do not use your weapon. Use MAGIC ONLY to kill them. If you fail to use only magic, the monster will disappear. When you talk to Nyakuri, you'll need to help her out by killing some monsters that look like ratmen [?]. Then you'll get a letter. Now, you'll have to head to Talking Island. First head back to Gludin via the gatekeeper or gatekeeper's token. Then you can either take the boat (2400 adena for the ticket) or use the gatekeeper and spend 18,000 adena. At Talking Island, you have to find Ramus who is on the road that leads down to the waterfalls. He will ask you to collect Undead Bones. Ramus is located at the end of the red arrow. Anyways, once you have the bones, take the boat again or the gatekeeper and head over to the Dark Elven region and kill the Dark Horror in the swampy area. When you kill the Dark Horror you'll get a Horror's Bone. [NOTE: According to a North American server player, you do not need to do this section, just get the bones and talk to Ramus.] After you collect 5 of them then return BACK to Talking Island and talk to Ramus. Ramus will give you a letter, the last letter. Congratulations, you have completed the Judgement of Reformer!